Researchers from the Moscow Institute of Physics and Technology and Tohoku University (Japan) have explained the puzzling phenomenon of particle-antiparticle annihilation in graphene, recognized by specialists as Auger recombination. Although persistently observed in experiments, it was for a long time thought to be prohibited by the fundamental physical laws of energy and momentum conservation. The theoretical explanation of this process has until recently remained one of the greatest puzzles of solid-state physics. The theory explaining the phenomenon was published in Physical Review B. In 1928, Paul Dirac predicted that an electron has a twin particle, which is identical in all respects but for its opposite electric charge. This particle, called the positron, was soon discovered experimentally. Several years later, scientists realized that the charge carriers in semiconductors—silicon, germanium, gallium arsenide, etc.—behave like electrons and positrons. These two kinds of charge carriers in semiconductors were called electrons and holes. Their respective charges are negative and positive, and they can recombine, or annihilate each other, releasing energy. Electron-hole recombination accompanied by the emission of light provides the operating principle of semiconductor lasers, which are devices crucial for optoelectronics. The emission of light is not the only possible outcome of an electron coming in contact with a hole in a semiconductor. The liberated energy is often lost to thermal vibrations of the neighboring atoms or picked up by other electrons (figure 1). The latter process is referred to as Auger recombination and is the main "killer" of active electron-hole pairs in lasers. It bears the name of French physicist Pierre Auger, who studied these processes. Laser engineers strive to maximize the probability of light emission upon electron-hole recombination and to suppress all the other processes. Thus, the optoelectronics community enthusiastically greeted the proposal for graphene-based semiconductor lasers formulated by MIPT graduate Victor Ryzhii. The initial theoretical concept said that Auger recombination in graphene should be prohibited by the energy and momentum conservation laws. These laws are mathematically similar for electron-hole pairs in graphene and for electron-positron pairs in Dirac's original theory, and the impossibility of electron-positron recombination with energy transfer to a third particle has been known for a long time. However, experiments with hot charge carriers in graphene consistently returned the unfavorable result: Electrons and holes in graphene do recombine with a relatively high rate, and the phenomenon appeared attributable to the Auger effect. 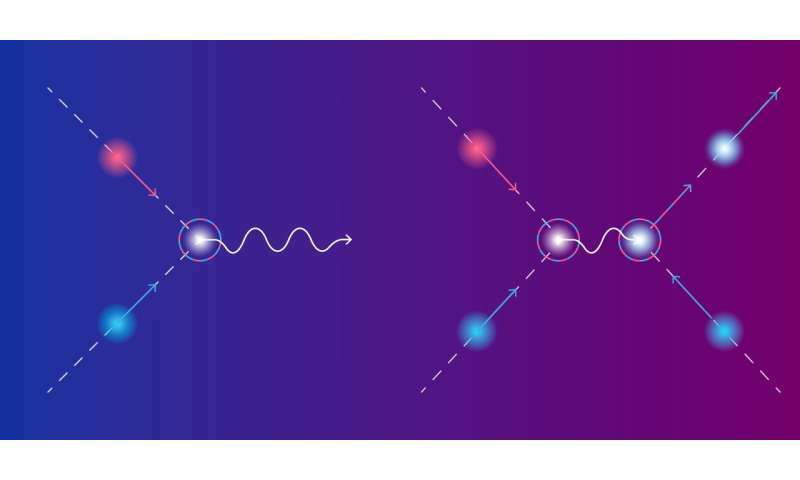 Moreover, it took an electron-hole pair less than a picosecond, or one-trillionth of a second, to disappear, which is hundreds of times faster than in contemporary optoelectronic materials. The experiments suggested a tough obstacle for the implementation of a graphene-based laser. The researchers from MIPT and Tohoku University found that the recombination of electrons and holes in graphene, prohibited by the classical conservation laws, is made possible in the quantum world by the energy-time uncertainty principle. It states that conservation laws may be violated to the extent inversely proportional to the mean free time of the particle. The mean free time of an electron in graphene is quite short, as the dense carriers form a strongly-interacting "mash." To systematically account for the uncertainty of particle energy, the so-called nonequilibrium Green's functions technique was developed in modern quantum mechanics. This approach was employed by the authors of the paper to calculate Auger recombination probability in graphene. The obtained predictions are in good agreement with the experimental data. "At first, it looked like a mathematical brain teaser, rather than an ordinary physical problem," says Dmitry Svintsov, the head of the Laboratory of 2-D Materials for Optoelectronics at MIPT. "The commonly accepted conservation laws permit recombination only if all three particles involved are moving precisely in the same direction. The probability of this event is like the ratio between the volume of a point and the volume of a cube—it approaches zero. Luckily, we soon decided to reject abstract mathematics in favor of quantum physics, which says that a particle cannot have a well-defined energy. This means that the probability in question is finite, and even sufficiently high to be experimentally observed"
The study does not merely offer an explanation for why the "prohibited" Auger process is actually possible. Importantly, it specifies the conditions when this probability is low enough to make graphene-based lasers viable. As particles and antiparticles rapidly vanish in experiments with hot carriers in graphene, the lasers can exploit the low-energy carriers, which should have longer lifetimes, according to the calculations. Meanwhile, the first experimental evidence of laser generation in graphene has been obtained at Tohoku University in Japan. Notably, the method for calculation of the electron-hole lifetimes developed in the paper is not limited to graphene. It is applicable to a large class of so-called Dirac materials, in which charge carriers behave similarly to the electrons and positrons in Dirac's original theory. According to preliminary calculations, the mercury cadmium telluride quantum wells could enable much longer carrier lifetimes, and therefore more effective laser generation, as the conservation laws for Auger recombinations in this case are more stringent.